The holiday season is creeping up, and if your household is anything like mine, that means lots of guests coming and going. With people dropping by so frequently I try to keep my house fairly presentable at any given moment. I'd rather be making drinks before guests arrive than rushing to tidy up before the doorbell rings! Keeping up with chores can be tough though, even on a regular week. Once you throw in holiday preparations and activities, it gets even tougher. 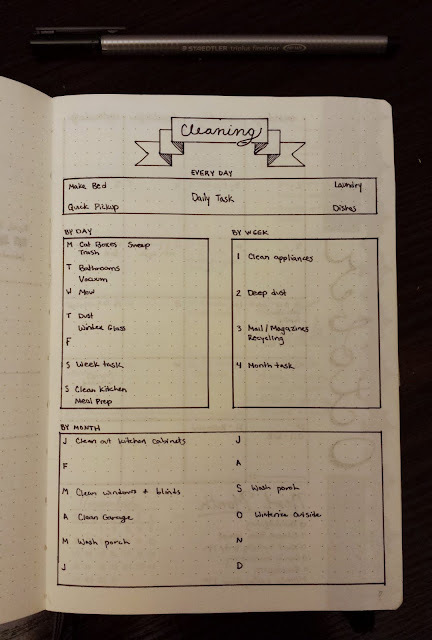 To stay on top of the dust and grime even when I'm at my busiest, I created my Bullet Journal cleaning routine. First things first, I made daily, short cleaning sessions a habit. One of the biggest assets of a habit is that it removes the in-the-moment decision making. You don't have to choose when and if you'll do something, you just do it. There's no mustering up the self-disciple to conquer a big daunting task. Instead, you can bite off a little piece of the task each day, almost mindlessly. In order to fall easily into a cleaning habit, I made my cleaning sessions as painless as possible. The best way I could do this was to keep them scheduled, short and focused. I decided when my cleaning session would fit in to my daily routine, and then tried to be as consistent as possible with it. Knowing when I wanted to clean was only half the battle, though. I wanted to make sure I didn't spend half of the time I was supposed to be cleaning gearing myself up and trying to decide what to clean. I knew I'd quickly grow to hate it if I left which chores I'd tackle up to chance. I found that the best way to protect myself from all wasted time and resentment was to create a cleaning routine! To create my cleaning routine, I made a list of all my chores. I organized the chores into four categories: chores done daily, chores done once a week, chores done once a month and chores done once a year. Once I listed out all my chores, I put them all together into a workable routine. I started by grouping my once-a-year chores into 12 groups, one group for each month. For my once-a-month chores, I only created 3 groups. With the once-a-week chores, I made 6 groups. 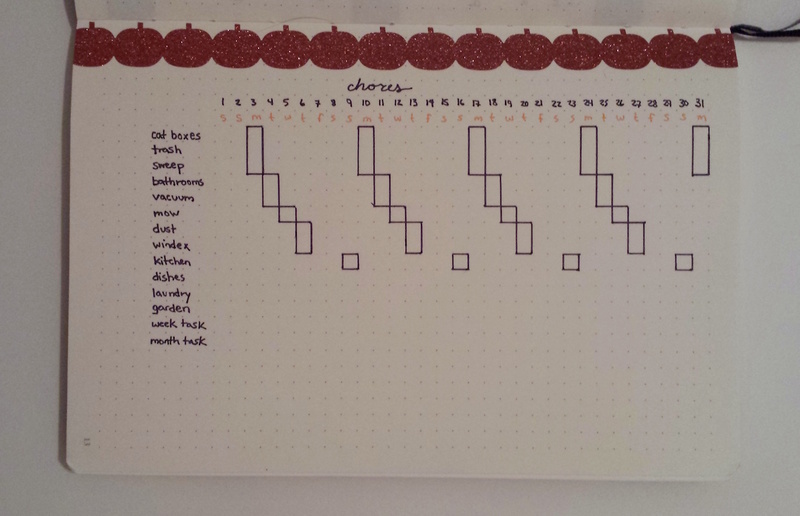 Here's my chore tracker from October, if you couldn't tell from my glitter pumpkin washi tape! Once I got into my cleaning routine, it was incredibly simple to keep my house looking amazing, no matter how busy life got. Now I can take my time when the doorbell rings, knowing that everything looks great! I hope this helps you fall into your own cleaning routine! 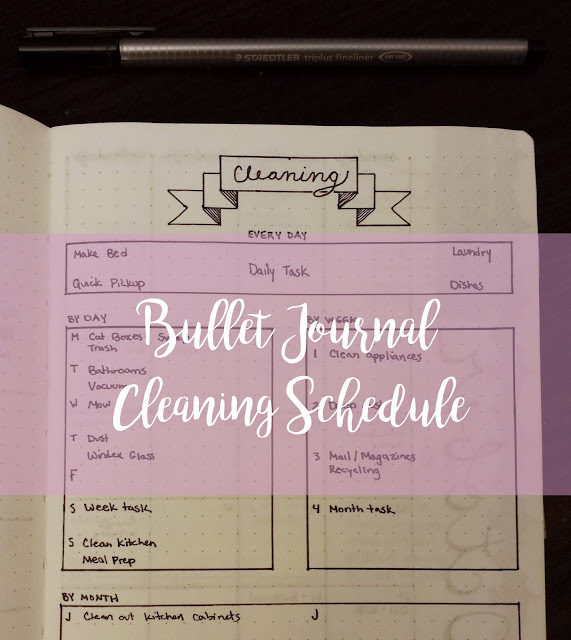 2 comments on "My Bullet Journal Cleaning Routine"
I never leave comments but I can honestly say that I love this cleaning schedule and have implemented my own based on your plan. It's simple and I no longer feel overwhelmed with what to do and when. It's completely doable. Thank you very much.